Poetry Ireland in association with the National Gallery of Ireland presents a reading by Rita Ann Higgins in the National Gallery of Ireland, Merrion Square West, Dublin 2 at 1.00pm on this Wednesday 1 July. Rita Ann Higgins is from Galway. She has published five collections with Salmon Poetry, including the most recent, Throw in the Vowels. Her plays, Face Licker Come Home, and God-of-the-Hatch-Man, were produced by Punchbag Theatre Company. She has won several awards and her work has been selected for Yale University's Literature Curriculum. She is a member of Aosdána, and lives in Galway. This is the first in a series of lunchtime Wednesday poetry readings in the Gallery during July. Playwriting Workshop Weekend with Acclaimed Writer Mark O’Halloran (right). Mark is a writer/actor from Ennis. As an actor he has worked with all the major companies, most recently as Lord Goring in The Abbey Theatre’s hugely successful production of An Ideal Husband. On screen he has appeared in numerous films, most notably as one of the eponymous heroes in Adam and Paul for with he wrote the screenplay. Mark’s other writing credits include the multi-award winning film Garage and the television series Prosperity. This professional development initiative is a Meath County Council Arts Office, Tall Tales Theatre Company and Solstice Arts Centre project. Seamus Heaney - Known World from Electric Light. I read this two days ago to the buzz of flies. Warm sunny weather means open windows - enter flies, not many but each has that drone, buzz that I hate so much. If I was left to myself I'd keep all windows closed. As it is I use flyspray much to the disapproval of other inhabitants. Quoting "I love the smell of napalm in the morning" is useless. The flyspray is hidden away. We used flypaper when I was young, don't see it in shops these days - world going to the dogs. You could make your own - instructions here. I might try it one of these days. Probably not worth it though, fine spell won't last, another wet summer I reckon. Very successful Open Mic session in Drogheda last night. 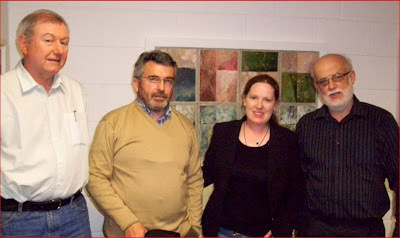 Four of us Boyne Writers attended - picture above. Over forty people were there at least half of whom read. These included published authors and first time readers, with a wide span of ages. A great selection of material, first chapters of novels, published poems and some work nervously being aired for the first time. We heard a piece to be read on Lyric FM's Quiet Quarter later this year. Especially good was the number of funny pieces - lots of humour, quite an amount of it delivered with exaggerated Drogheda accents. We had a very well delivered and received rap which livened things up no end. Music was also included and there was wine and nibbles. Quite a number of the readers are included in the recently published Drogheda Writes 2 which was edited by Barbara Smith and Roger Hudson. Roger was there as were Marie McSweeney and Honor Duff, winner of the Cavan Caomhnu poetry competition earlier this year. The venue itself was excellent. The reading took place in the spacious Callan Art Gallery which is attached to Boyne Books, the new and secondhand bookshop recently opened in West Street. The featured artist this month at the gallery is John Philip Murray and his paintings provided a interesting backdrop for the evening. One or two readers did read a little longer than they should. For an open mic like this where there are plenty of readers two or three short poems or the prose equivalent is enough. Leaving the audience wanting more rather than wondering how many more is he going to read seems the best plan. Apart from that, a most enjoyable night. Congrats to the organisers and readers! Poet Seamus Heaney has lent his voice to the Vote Yes to Lisbon campaign. 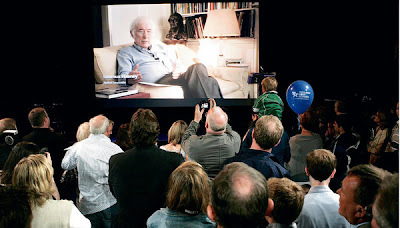 At the weekend launch of a newly formed group Ireland for Europe, the organisers showed a film of him reciting his poem Beacons at Bealtaine, along with a declaration that “there are many reasons for ratifying the Lisbon Treaty, reasons to do with our political and economic wellbeing”. Irish Times report here, Irish Independent here. New open mic session at Boyne Books, Narrow West Street, Drogheda on Thursday 25 June at 8pm. There is a €3 cover charge to cover refreshments. The organisers hope this will be the first of many open mic sessions in this recently opened bookshop on West Street. Guests at this event will also be able to enjoy the first public fine-art exhibition at Boyne Books with large photographic prints by Slane-based photographers Catherine and Robert Ardill based on the theme of 'Boyne Valley beautiful' which runs June 25th-July 12th inclusive. More details can be obtained from Boyne Books, 56-57 West Street or by phoning 0419873835. 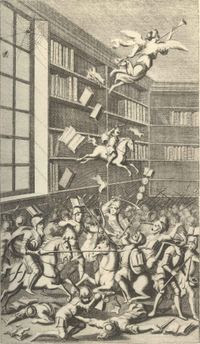 One of the innovative ideas which the Trim Swift Festival came up with this year was a live spoken satire contest which they have entitled The Battle of the Books. This is in addition to the written satire competition the short list for which was announced last week. Two teams representing the Boyne Writers Group and Meath Writers Circle will deliver their satirical pieces as part of a Swift Literary Cabaret on the Sunday night of the festival. The rules are simple, four per team, two poems, two prose pieces, satire on any topic, must be written by the person who delivers it, time limits - 3 minutes poem, 5 minutes prose. A panel of three judges will deliver their verdicts round by round in an X Factor style. Tommy Murray is the captain of the Meath Writers Circle and I am the captain of the Boyne Writers. Our group is holding rehearsals at a secret location this week to hone our delivery and no doubt the opposition is doing likewise. Any reports or secret information welcomed. Full details of the Festival on their website including booking details should you wish to attend the contest. Other items on the programme are the reading of the winning entry in the written satire conpetition and a rehearsed reading from Gulliver's Travels by Trim Drama Group. It's Fathers' Day today - not as big a commercial event as Mothers' Day but a valiant effort being made by commercial interests to develop it. Many father and daddy poems have been written, most with some kind of edge to them reflecting the position, status and function demanded by society of fathers certainly in the past. It may be that being cast as the provider, the chastiser, the one who went out to work did not often lend itself to tender memories. I think of Heaney's surprise in Mid-Term Break at seeing his father crying. Sylvia Plath's Daddy is a particularly chilling poem especially when you hear her reading it. You can hear it here on YouTube and read it here. Lots of discussion on the poem on the Sylvia Plath forum here. Poets.org has a selection of poems about fathers for Fathers Day here. Irish Times Friday article on Father's Day here. 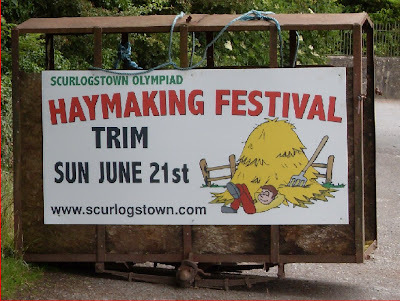 Tomorrow Sunday 21st June sees the annual Scurlogstown Olympiad’s Traditional Haymaking Festival taking place in Trim’s Porchfields in a most picturesque setting along the banks of the Boyne with a great view across the river to Trim Castle. The event features as usual a packed programme which includes the National Scythe-Cutting competition. There are also some dramatic events - Trim Drama Group will perform a scene from the 'The Plough And The Stars' by Sean O’Casey following their successful runs in Trim and Navan and Boyne Writers Group member Paddy Smith has scripted and directed a re-enactment/ drama/ pageant about farmer Dan O’Hara and a group of travellers. I don't wish to give away the plot but it appears that Dan's daughter, Nancy, may take a fancy to one of the travellers. There will also be a poetry house at the festival under the stewardship of Meath Writers' Circle leader, Trim poet Tommy Murray. Poets and those interested in poetry are invited to drop in and read their work or just listen. More details of the packed programme here on the website and here in the Meath Chronicle. There has been some comment about the poster above especially about the hayfork. It has four prongs and my memory is that a hayfork or pitchfork should have only two. However you have to be careful, the exact make up of farm implements in the past could be very localised with different style used in different regions. The fork in the poster I would call a graipe and we would have used it for cleaning out manure but not for hay. Our pitchforks had two prongs and had to be light and easily handled. Notice that the "pitchfork" in the illustration here has five prongs. That came near to an imagined perfection . . . It felt like a javelin, accurate and light. By the way how many prongs in the pitchfork in Grant Wood's 1930 painting American Gothic? Answer here. We held the third of our Readings and Open Mic last night. Well attended. Our featured readers were Trim poet Tommy Murray and self styled "gentleman farmer" George Briscoe. George read from his two books of memoirs and entertained the audience with memories of hunting days, the setting up of what was to become Royal Tara Golf Club, training with the Local Defence Force (the Dad's Army of the day, he described it) during the forties and much more. Tommy Murray is a well-known poet in Trim, Meath and beyond. 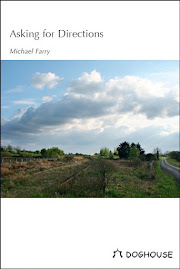 Work of his is included current issue of the NUI Galway Anthology ‘Ropes Unravelled’. 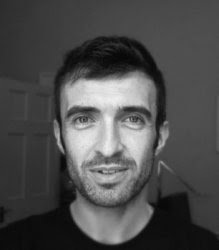 He is the founder of the Meath Writers' Circle and is a creative writing tutor. He has published a number of anthologies of children's work. A collection of his, Counting Stained Glass Windows, is due out from Lapwing Publishers during the summer. He read a selection of his poems, old and new, with his usual good humour. The open mic was enjoyable with a nice balance of prose and poetry. Among the readers was Meath Writers' Circle member William Hodgins who read from his first book of poems "Sunflower" which he recently published. We are taking a break from the readings for the summer but will probably be back in September. The annual In the Footsteps of Ledwidge sponsored walk will be held on Sunday 28 June. This year’s walk will involve a guided tour of the Hill of Tara. Ms. Helen Tully, tour guide at Brú na Bóinne and a valued member of the Ledwidge Museum Committee will be the guide on the day. Helen will explain the archaeological wonders of Tara where it has been established that human activity goes back to the Neolithic period. 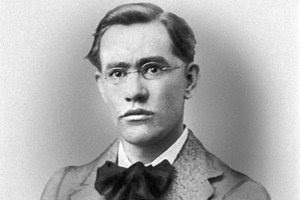 She will also link Francis Ledwidge’s association with Tara and nearby Dunsany Castle. The walk will commence at 3pm at the entrance to Tara. If you wish to join the walk please contact the Ledwidge Cottage Museum (Phone: 041-9824544 or email info@francisledwidge.com) for a sponsorship card, or come along on the day and make a donation. Lifts from Slane can also be arranged, again please contact the museum for details of same. Labels: Francis Ledwidge Museum; Tara. Two prominent and colourful local writers are the featured guests for the June session of Boyne Readings and Open Mic on Thursday (June 18) in Trim. Tommy Murray, Summerhill Road, Trim (above) and George Briscoe, Craystown House, Bective, have the top billings for the session, which takes place in The Village Hall of the Knightsbridge Retirement Village on the Longwood Road, starting at 8pm. The two featured readers are well-established writers. Tommy Murray, a leading poet who has won awards in competitions throughout Ireland, is the founder and driving force behind the Meath Writers Circle, based in Trim. 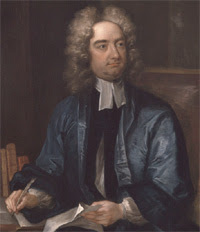 He has had many books of poetry and prose published, and also has a reputation as a facilitator and teacher of poetry-writing among schoolchildren. George Briscoe was Master of the Tara Harriers for over 65 seasons. He is the former owner of Bellinter House, which he sold in 1954 for £36,000, and he describes himself as “a country gentleman”. He has published extensively about his life and times, most notably in one of his books, The Best Of Times. Admission to the Boyne Readings and Open Mic is €5, which includes tea/coffee and biscuits. Have a laugh with this film posted on YouTube, even if you are a Fianna Fail supporter. The result of the election for Trim Town Council may not be world news but the subtitling in the film is just brilliant - Adolf Hitler playing Anthony Hopkins playing Minister Noel Dempsey! I could start explaining the references but there's really no need. If you really want to know some background read the Meath Chronicle article on the Trim election. Enjoy. There's also some actual film of the Trim Council count on YouTube - just seach for Trim Council Election. 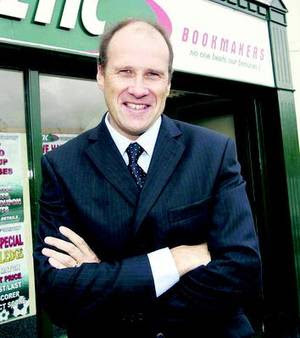 The judge for the competition is Ivan Yates chairman and managing director of Celtic Bookmakers and a former Fine Gael politician and government minister. He has also been presenting an early morning radio show. The winner and runners up will be announced by the end of June. The winner will be invited to read his/her winning entry at the Swift Summer Night in the Knightsbrook Hotel, Trim on 5th July. Today's Guardian has a review by Peter McDonald of Heaney's translation of The Testament of Cresseid & Seven Fables by Robert Henryson which I blogged about a week or two ago. "The poem is a masterpiece; and Heaney's version shows an unobtrusive, but real, mastery of its own". The same newspaper has a review by Sue Arnold of Heaney's reading of his Collected Poems - "For me he is the most thoughtful, the wisest and yet most accessible of all modern poets. His talent - one of them - is his ability to reconfigure the familiar." I'm more than half way through the collection, determined to get to the end, reading and listening at the same time. 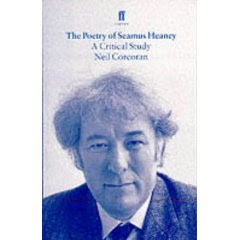 I'm also dipping into a few books of criticism - Sea mus Heaney The Making of the Poet by Michael Parker, The Poetry of Seamus Heaney - A Critical Study by Neil Corcoran and The Poetry of Seamus Heaney - A Reader's Guide to Essential Criticism edited by Elmer Kennedy-Andrews. From the last book comes this wonderful remark on Heaney's popularity - The rise in Heaney's reputation and the boom in health foods are sociologically connected - making the point that the poet's early country poems seem to mirror modern fashionable anxieties about urbanisation and technology. I'm just starting Seeing Things now. Three volumes (or is it four?) to go. The satire competition organised by the Boyne Writers Group in connection with the Trim Swift Festival has closed. The entry this year is in the region of thirty five which is an increase on last year's entry. The organisers are pleased with this considering that satire is quite specialised and that topics are given so that writers have to come up with a new piece of writing. Most of the entries are from Ireland but there are a number from the UK and from Canada and the USA. The poetry/prose split is about half and half. The standard seems high with many writers enjoying the opportunity to castigate banks and bankers. There is the problem that the present economic crisis has resulted in so many events which would have previously been unthinkable that some of the satiric suggestions seem almost believable. Some poets delighted in finding as many rhymes as possible for "bankers". The short list should be announced early next week and the winner and runners up announced before the festival takes place. The winning entry will be read at the final event of the Festival, the literary night on Sunday 5th July. Last year's winning entry can be read here. The full programme for the Trim Swift Festival is here. The National Library of Ireland has just introduced an online service whereby 20,000 photographs from the Lawrence, Poole and Independent Newspapers collections (1870-1954) in their National Photographic Archive can now be viewed on the Library’s website here. The initiative is part of an ongoing digitisation project designed to increase online access to the National Photographic Archive’s extensive collection of glass plate negatives. These are part of the National Library’s photographic collection, the largest collection in the world of photographs relating to Ireland. The database provides an easy means of searching the information about all 20,000 digitised photographs, including the option to search by keywords such as “eviction”, “election”, “women”, or “market”. I searched for "poet" and "poetry" but got no results. 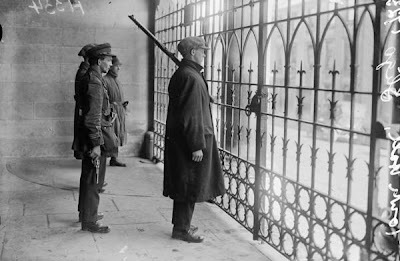 The picture at the top, from the archive, from Independent Newspapers, is captioned Member of the Free State Army guarding Sligo Town Hall and dated 16 August 1922. This is a very interesting picture. 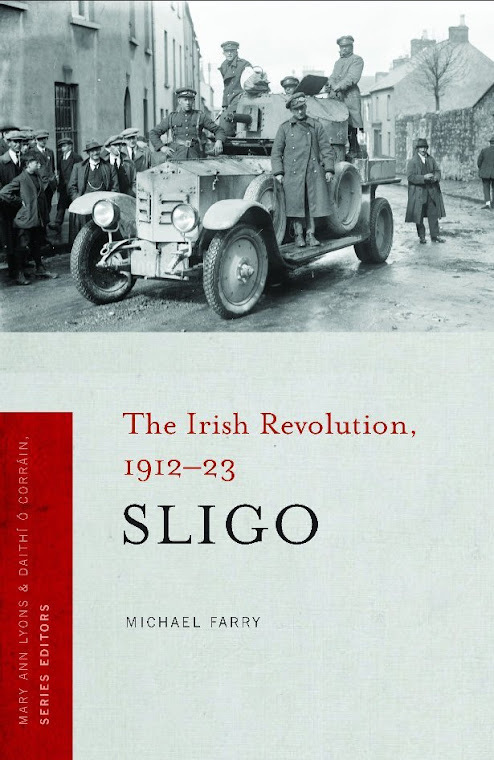 I included a very similar one with most of the same people in it in my The Aftermath of Revolution book as a photo of anti-Treaty soldiers in Sligo in April 1922 on the occasion of Arthur Griffith's pro-Treaty meeting there. (New York Times report here) I got the picture from George Morrison. In fact both my picture and the picture above are from a Pathe Newsreel of the April sligo event. You can actually see the newsreel on the wonderful Pathe Archive here. So are they pro- or anti-Treaty? It matters little now but it's definitely April 1922. Someone did tell me that the officer with the revolver may be Harry Brehony who was shot dead in Coolaney, Co Sligo during the Civil War. If that's true then they are definitely anti-Treaty. They lost that war of course. 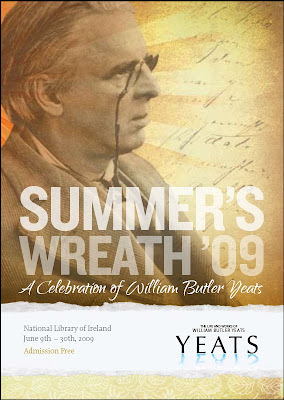 This month the National Library, Dublin, hosts its third annual celebration of the poetry of William Butler Yeats through a series of poetry readings, interviews and other events in Summer’s Wreath 2009. Details and a full schedule can be found on the National Library’s website on their website here. 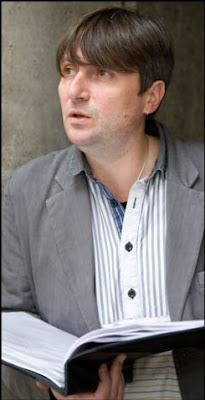 Thise includes talks on the poet and readings from his work by the likes of Bob Geldof, Marina Carr and Jennifer Johnston. One of the most interesting appears to be that of Wednesday 17 June at 7.30pm when Yeats’ biographer, Prof. Roy Foster and actress Fiona Shaw reflect on the themes of Yeats’ poetry in his final years. Fiona Shaw was featured in one of the Poetry Season programmes on BBC, reading and commenting on some of John Donne's poetry. Booking is essential for the National Library event, more details here. Ireland beat Bangladesh in the World Twenty 20 cricket tournament yesterday. An excellent bowling performance saw Bangladesh scoring only 137 in their 20 overs. Wicket keeper Niall O'Brien was man of the match with a great stumping and a strong performance with the bat in spite of an ankle injury. He and his brother Kevin scored 79 between them to win with 10 balls and six wickets to spare. Ireland was on paper the weakest team in the group. Ireland play India on Wednesday 10 June at 5.30pm but are guaranteed to progress to the Super Eights part of the tournament because Bangladesh have already lost to India. Another big surprise is that one of the favourites, Australia, lost their two group matches and are out of the tournament. Labels: World Twenty 20 Cricket; Irish cricket team. The Cricket World Twenty 20 tournament opened in England on Friday night. Actually the opening ceremony had to be abandoned because of the rain and the opening match between hosts England and minnows Netherlands (Yes Netherlands has a cricket XI) provided a shock, Netherlands winning. They needed to score two from the last ball and did so thanks to an overthrow by Stuart Broad (An overthrow is when an attempt to knock the wicket misses and goes so far that another run can be scored). See picture right - that's Broad on the ground! A lot of adverse comment in the English media. Of course the whole concept of Twenty 20 cricket is sneered at by many who regard it as pandering to the short attention span of the modern fan. Twenty 20 means each side bowls 20 overs so the game is completed in an afternoon. To many the only real cricket match is the five day test match. To be fair to cricket, a game many would regard as a relic of ancient manners and customs, the controlling bodies seem very willing to make changes in format and rules to make the game and its various versions more enjoyable. The Irish cricket team is taking part in this tournament in a group with India, one of the favourites, and Bangla Desh. Their first match, against Bangla Desh, is on this afternoon at 12.30pm and the other match against India is on Wednesday at 4.30pm. It would be a major suprise were Ireland to win any of these matches. Cricket in Ireland has a long history. More here. The short heatwave is over and everyone feels normal again. The sun hats have been put away with the sunscreen, sunglasses and the shorts. All that expensive garden furniture and BBQ sets that were bought all over the country last week are soaking in the wet, looking very forlorn on the drenched patio. 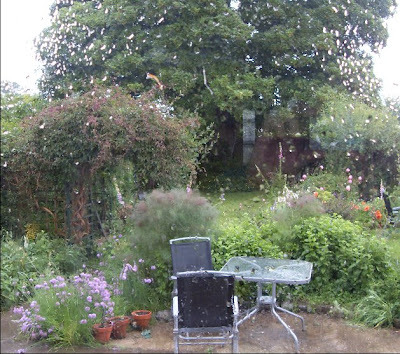 Those plans for the garden have been shelved and the washing which was hung out is now wetter than it was three days ago. We don't really like hot weather here I believe. When a sunny spell arrives most people don't trust it first and it takes two or three days before they change into suitable clothes. Research in the papers last week questioned the widely held assumption that fine weather makes people happier. Irish Times article here. Lots of rain poetry and most of it has some metaphoric significance as in Raining in My Heart the B side of Buddy Holly's last release. I remember learning this simple poem by Irene Thompson in primary school long ago. I always liked it and can still say it by heart. It is used in a 2008 exam question from Malta here. The students are told that looking glass = mirror and that jet = black. And the weather forecast? Check it here. The most unsettling museum I have ever visited has to be the International Slavery Museum at Albert Dock, Liverpool. (Auschwitz can't be regarded as a museum) The relatively small space is filled with exhibits, visual, aural and video and there is a constant barrage of information in the dimly lit area - one horror after another. The display galleries concentrate on the history of transatlantic slavery, its many legacies, and the wider issue of freedom. They explore the story of transatlantic slavery from the complex and vital cultures of West Africa before the coming of the Europeans, through the horrific middle passage on board ship, to life in the Americas. The question which arises is the same question when you consider any of the great injustices of the past, Irish or international - How was it allowed to happen? It also raises the question of the guilt of the first world in the present condition of so many of the countries from which slaves originated. The museum does outline the long history of determined and relentless resistance to enslavement, and how enslaved people themselves contributed to gaining their eventual freedom. It also celebrates the cultural contribution made by people of slave origin. The museum, opened on 23 August 2007, explores the important role that Liverpool played in the trade. The location is only yards away from the dry docks where 18th century slave trading ships were repaired and fitted out. "Make no mistake, this is a museum with a mission. We wish to help counter the disease of racism, and at the heart of the museum is a rage which will not be quieted while racists walk the streets of our cities, and while many people in Africa, the Caribbean, and elsewhere, continue to subsist in a state of chronic poverty. This is not a museum that could be described as a 'neutral space' - it is a place of commitment, controversy, honesty, and campaigning" - transcript of the speech given by David Fleming, director of National Museums Liverpool, at the gala dinner to celebrate the opening of the International Slavery Museum on 22 August 2007. This New York Times report on the museum is a good summary and gives the feeling well. BBC news report on the museum containing a video tour here. Penny Lane, the street made famous in song by The Beatles is named after a Liverpool slave ship owner and anti-abolitionist. Poem Middle Passage by American poet Robert Hayden. Thanks to Honor Duff alerting me to this TV review column in the Sunday Times where the columnist A A Gill has a go at the plethora of poets and poetry related programmes on the box recently. I gave up reading this kind of thing when TV and Radio review newspaper columns became entertainments (about the time of the Black Death - I hear Paddy say). Anyway you can almost hear A A loading in as many old and new cliches about poets and poetry as he can for a laugh. Read it all if you must. poetry isn’t drama: the imposition of a character, the inflection of emotion and opinion, diminishes it. Despite its origins, the whole business of out-loud poetry is problematic. Nobody will ever read you Donne or Shakespeare’s sonnets or Eliot with more poignancy and meaning, more beautifully, than the voice in your head. This is interesting and I'm not sure that it's so easy to be dogmatically on one side or the other in this argument. I'm listening to Heaney's reading of his work at the moment and reading it on the page at the same time. His readings add a lot of meaning to the work. I'm also involved in the Boyne Readings and open mic series and have read at the White House and in Trim. I do see reading a poem to an audience as a performance and I take care with stress, pauses, emphases trying my best to get the nuances across. I don't see it as acting though. Does we have to have this argument? I don't think so. If we accept that there are many ways of learning then surely some people will gain more by hearing a poem rather than listening to it. There is the hope that listening to poetry may encourage people to buy and read more poetry. That can only be good can't it? Portrait of John Donne in the National Portrait Gallery, London. I always think of the Oriental Poppy as the aunts you were fascinated by but slightly ashamed of in your youth, extroverts, daringly dressed, wearing bright red lipstick. These have flourished and multiplied in the garden and make a great show at this time of year, their strident colour a great contrast with the more restrained tones around them. "It's summer" they seem to say "What the hell!" Each bloom lasts a very short time but there are many more to replace them. A real star of the summer garden. A poem The Poppy here by Francis Thompson of The Hound of Heaven fame. 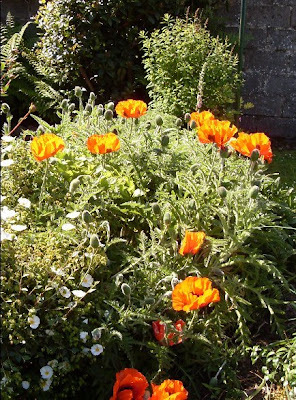 The Red Poppy here by American poet Louise Gluck. 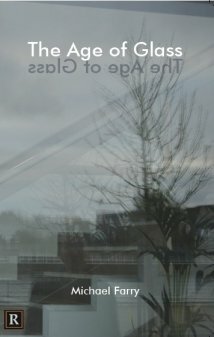 Three poetry competitions closing very soon, all from the west of Ireland. In her post here Emerging Writer talks about the ROI of competitions - return for investment, entry fee versus prizes. Judge yourself from the details below. To celebrate the 50th anniversary of the Yeats summer school and the 70th anniversary of the death of WB Yeats, the Hawk's Well Theatre Sligo announces the inaugural iYeats Poetry Competition 2009 - an online national and international competition open to all and with a special award for poetry from poets under 25. Prize giving and a Public reading of the shortlisted poets will take place during the annual Yeats Summer School 2009. The twin themes of the iYeats Poetry Competition 2009 will be POLITICS and LOVE. Poems will be accepted on these subjects with closing date of June 12th 2009. Entry fee is 5 euro anf first prize is 300 euro. Maximum length 40 lines. Full details here. I don't have many poems on either politics or love but using a very broad definition of love I might enter one or two. Closing date for entries, 15th June 2009. €5 per poem. Prizes are €300 for the winning poem and €50 for the four runners up. Prizes will be awarded on Sunday 26th July at a ceremony during the Boyle Arts Festival. Maximum length 40 lines. Details here. One of our writing group, Brendan Carey Kinane, won this competition two years ago and I had a poem highly commended so I'll certainly enter this again. Different judge this time of course. Leyney Writers in Tubbercurry, Co Sligo are accepting entries to their fourth annual writing competition. There are three categories: short story, free verse or rhyming verse. Prizes are: €100 or €50 in each category. The entry fee is €10 per entry. The story word limit is 1,500 words; poetry limit is 200 lines. Post to Tubbercurry Literary Festival, Short Story Competition, Leyney Writers, 25 Ballina Road, Tubbercurry, Co. Sligo. Closing date for entries is June 13, 2009. More details here. 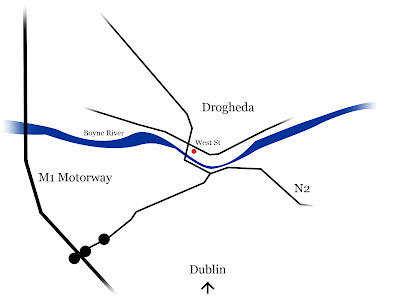 That poetry line limit is very unusual and I think I'll send them a 110 line sequence I completed recently based on the Leixlip Bridge Eucharistic congress road accident I blogged about some time ago here. My main cribs with competitions are the inability to enter online especially for competitions abroad where sending the fee is then a problem and the fact that many competition websites never announce the results of the competition. Only the iYeats competition above has online entering. Some competitions insist on only accepting entries by hard copy but allow online payment by PayPal or similar. Use the possibilities of the internet! Newsnight Review special on poetry last Friday included a discussion on poetry during which the question was asked "Does poetry have an image problem? The best contribution was by poet Simon Armitage (right): "The answer to the question is of course, that's what it's there for - to have an image problem. Poetry is obstinately not trying to appeal to everybody, it's disobedient, it's contrary. It doesn't reach the right hand margin most of the time, it doesn't even reach the bottom of the page a lot of the time, it simply isn't there to please everybody. . . . Poetry has always existed between two kinds of death, a death where it's so obscure that no-one wants to read it and a death where it's so facile that it can't simply be doing its job and between these perameters it's always going up and down." A nice answer to those who think that poetry must be made "easier to understand" for the "ordinary man in the street". We must credit the poetry reader with some intelligence. This discussion is part of the poetry season which the BBC is running at the moment. I saw some of the programmes and recorded more for future viewing - when the rain returns! The programme by Armando Iannucci on Milton's Paradise Lost was very good and that poem is next on my reading list. Next highlight is possibly the Arena profile of T S Eliot on Saturday 6 June at 21:45 on BBC Two. 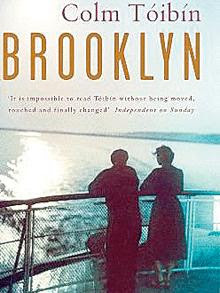 I have just finished Brooklyn and have to register my disappointment. I found it lifeless and ponderous and at no stage was I moved to any great interest or sympathy for the characters. It did improve in the second half with the telephone conversation between the main character, Eilis, and her mother a high point. I feel that if you are going to write about the fifties in Ireland than you had better do it in a way that makes your novel stand out from the thousands of similar stories with the same general theme and plot. The beginning, middle and end of this story are where you would expect them and there is no relief from the one-thing-after-another storytelling style. At no stage did I feel that I was close to the main character as you might be in a John Banville novel. The style, which includes long involved sentences, keeps the reader at a distance from the characters. Some of the plot devices seem contrived especially the ending where Miss Kelly is used to spur Eilis to her final decision, a decision which up to then seemed highly unlikely. There are nice things in the book. There is the unsettling feeling that everyone knows more than they let on to Eilis. There are also interesting comparisons between Enniscorthy and Brooklyn as regards class and status. It strikes me that if Eilis' mother lived another decade or two she would have had a great time being flown over to Brooklyn for her grandchildren's baptisms, confirmations and weddings. Eilis herself would have prospered in the USA and her and her children would have returned on holiday many times to Wexford. Emigration, while it may have traumatic, was for many a very positive move. The reviews of the book are generally very good, review in the Independent, "accomplished and at times enigmatic", here, Telegraph, "quietly magnificent" here, London Times, "beautifully executed ", here. Irish Independent, here. In the Irish Times John Waters writes on the book, Tóibín and much more here - Novel that could touch soul of the nation.